Like the best of Vlambeer's cannon, a simple concept executed beautifully. Limited enemy and level design, though. Luftrausers is a breathless arcade delight - video game dogfighting has rarely been better. Luftrausers may suffer from a few bugs and interface issues from time to time, but at its core is a magnificently modern aeronautic arcade experience. Luftrausers' arcadelike simplicity makes conquering the skies feel natural and fun. Gives you the constant feeling of just escaping death at the last moment. Vlambeer's new shooter is as hectic as it is addictive. Vlambeer improves on one of its smaller, free releases with Luftrausers, expanding an excellent dogfighting game with a ton of customization and a great soundtrack. Short play sessions means it's the perfect game to play on the bus, between classes, or even during your boring meetings. Just don't scream out loud and pump your fist in the sky when you finally beat your high score. That's rude. Fast fun and devilishly hard, Luftrausers shows once again that Vlambeer understands how to make classic arcade mechanics feel fresh and exciting. It's great in short bursts, the speed of each round often terribly brief, but lends itself to hour-long sessions of hammering on the controller to start a new game. While the pacing occasionally runs into a few issues, this is still a phenomenally fun shoot-em-up that will challenge players to meet its demanding difficulty. The real enjoyment in Luftrausers doesn't really come from experimenting, it's more about finding the right fit. It's really about performance, not options, and the game's longevity and value come from excellent tuning and feedback. You launch, then you thread the needle, push the envelope, curse your foes, and go out in a blaze of glory. Luftrausers is a beautifully balanced exercise in frustration and release – a simple but excellent instance of what can be done with slippery physics, simple graphics and a lot of guns. A lot. Deeper and longer games are on the market for $9.99, but few will match Luftrausers' addictiveness or its knife-sharp balance of frustration and elation. The near-perfect controls combined with the great soundtrack and visuals mean it's difficult not to like Luftrausers, and its simplicity makes it accessible to everyone. There are a few small issues, such as a difficult menu and the odd frame rate drop, but none that impact the overall game significantly. Luftrausers is well worth your time and money, and is easily Vlambeer's best game yet. If you strip away the Rauser parts and the catchy soundtrack, Luftrausers would still stand on its own because of its excellent gameplay. But those features add so much depth and excitement that they actually pushed me to become a better player. Judging by the wide gap between my score and those higher up on the leaderboard, I still have a lot to learn. [Luftrausers] is such a little thing. I have to focus hard to remember it when it's not right there in front of me. It probably doesn't have much staying power. But when it's there, when the sound of machine-marking throbs through my speakers, when I drop like a stone into the ocean then rebound heroically skywards, with smoke pouring out my engines, it's everything that matters. There are no secrets to Luftrasuers; it has no surprises. It comes to you with open hands, unwilling to explain if you'll enjoy playing it because you're reminiscing about how this style used to be cutting edge, or if you just need to see if there's that perfect configuration that will take you all the way. It's not about being good or bad, it just about being what it is and if that's something you want. 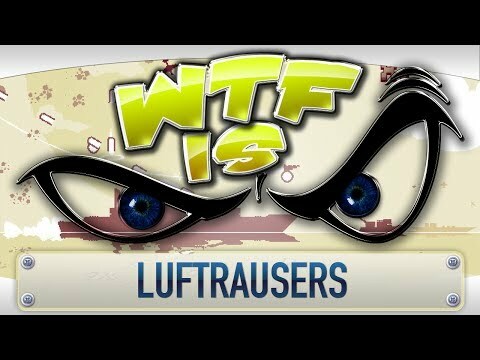 Unfortunately, that's all there really is to Luftrausers. It doesn't have the personalization of Beat Hazard and it doesn't have the level of content that Pac-Man Championship Edition has. In many ways for the entry point of ten dollars there are better options out there. But if any of what you've read sounds intriguing or if you see the game on sale, take to the skies and enjoy the ride. Often frustrating and sometimes unfair, but the glorious flight mechanics, general compelling gameplay, and attention to detail mean Luftrausers is easily worth considering. Ultimately, Luftrausers is a game that balances a lot on its plate. It is easy to pick up but demands a lot of patience. It is challenging but lays all its cards out on the table within a very short time. It is fast and exciting, but requires the player to adapt. But it also doesn't pretend to be anything it's not, and all in all I found it to be a fun experience.